LadyVolNation when I say stand up, I mean get on your feet for this next introduction. Victoria Baugh deserves every bit of it! Let me start by saying I really love this kid right here. Being a LadyVol fan over 15yrs, I have been able to spot those who are truly passionate about the game, but also passionate about that "orange" on they chest, and this young lady epitomizes LadyVol basketball. 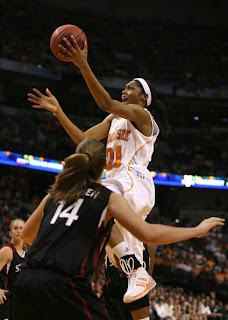 When I first watched Vicki play, I honestly began to think, "the next big thing" at Tennessee! Yes that was my first impression. That 6'4 lanky frame hit the court with one thing in mind: WIN! Vicki is a great post player, whether she is at the Center spot or down on the low block, she gives the opponents nightmares. In a game against LA Tech in the 07-08 season she had 6pts/16rbs/4blks/4asst...tell me that just don't give you chills as a LadyVol fan. Vickie's seasons have been cut short due to injury. She tore her acl in the national championship game versus Stanford, she had 8pts/4rbs in that game. I call her the HEART of the team because even on that team laden with Seniors, in the biggest game of their season, she screamed out "Let's Go Ya'll, Let's Go" with tears streaming down her face, as she limped away in pain. I watched Nicky Anosike shed tears, and watched Candace Parker get this look on her face that said, we are not going to lose this game. Vickie got her leg wrapped up, and came back out on crutches to watch her teammates win their second national championship back to back. Nation when Vicki is on the floor, this high powered offense flows so smoothly, and the defense cranks up a notch. I truly believe Vicki loves blocking shots and rebounding more than any points she scores. I know we have been spoiled and have at times taken for granted the "greatness" that has graced The Summit (Charles, Holdsclaw,Catchings, and Candace Parker), but when this one gets back on the court we have to show our appreciation! If you don't believe me, just watch how this team flows with Vicki in the lineup, observe it for yourself, she is a fearless leader, and she loves everything about Tennessee! That's what we want right? (imagine Baugh,Kain,Johnson, Bjorklund, and Stricklen as the starting 5)! One more time-standing ovation for Victoria Baugh.